"Never trust a man that can count to 1023 on his fingers." To represent two, raise two fingers. To represent six, raise six fingers. To represent 67, grow more fingers. This is funky base-2 counting on your fingers. 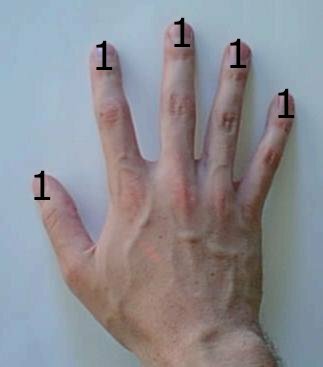 Each finger represents a different value now, so you have to start counting with '1' at your pinky, then '2' with just your ring finger, and '3=2+1' is pinky and ring finger together. '4' is a single raised middle finger. Then '5=4+1' is middle finger and pinky, and so on. Just 10 digits actually allows you to count all the way to 1023, but we'll ignore the thumbs and just use 8 fingers, to count up to 255=128+64+32+16 (left hand palm-up, pinky is 16) +8+4+2+1 (right hand palm-down, pinky is 1). To represent one, raise the 1 finger. To represent three, raise the 2 and 1 fingers together. To represent ten, raise the 8 and 2 fingers together. To represent twenty, raise the 16 (left pinky) and 4 fingers. To represent 67, raise the 64 (left middle finger), 2, and 1 fingers. This is actually somewhat useful for counting--try it! Counting on your fingers is "digital" computation--it uses your digits! What's the deal with all this hex? Humans have used the "place/value" number system for a long time--the Sumerians used base-60 in 4000BC! (Base-60 still shows up in our measurement of time and angles: hours have 60 minutes, which have 60 seconds, degrees also have seconds, and the circle is divided into six sections of 60 degrees each. The Maya used base 20. The world standard, though, is now base 10 using Arabic numerals. For example, I'm 34 = 3 * 10 + 4 years old. But every computer built today uses binary--1's and 0's--to do its work. The reason is electrical--0 is no voltage, 1 is voltage. Having just two states makes it easy to build cheap and reliable circuits; for example, a transistor will threshold the input value and either conduct or not conduct. A single zero or one is called a "bit". OK, so we got 1's and 0's: how to we build bigger numbers? The modern standard method is using "binary", which is just the place-value system using base 2. In binary, 1 means 1; 10 (base 2) means 2 (base 10); 100 (base 2) means 4 (base 10); 1000 (base 4) means 8 (base 10); 10000 (base 2) means 16 (base 10); and so on. Every machine produced today supports direct binary arithmetic. Sadly, for a human writing or reading binary is really painful and error-prone for large numbers. For example, one million is 11110100001001000000 (base 2), which is painful to write or read. So instead, we often use a larger base. Back in the 1970's, it was pretty common to use octal (base 8), but the modern standard is hexadecimal--base 16. Base 16's gotta use 16 different digits, and there are only 10 arabic numerals, so we use normal alphabet letters for the remaining digits. For example, 15 (base 10) is just F (base 16); an one million in hex is F4240 (base 16). You've got to be careful about the base, though--the string "11" would be interpreted as having the value 1*2+1=3 if it was base 2, the usual 1*10+1=11 if it was base 10, or 1*16+1=17 in base 16! Base 2: binary. Used by all known computers. Base 8: octal. Popular back in 1970s, 1980s. In C++, prefix the number with zero to make it octal, like "070" (==7*8 = 56). Base 10: decimal. Matches number of human fingers. In C++, numbers are decimal by default. Base 16: hexadecimal. Fits nicely with bytes. In C++, prefix the number with "0x" (zero-x) to make it hex, like "0xF3". Base 20, used by Mayans. Matches number of human fingers and toes. Base 60, used by Sumerians six thousand years ago. Note that every single number is listed in hex--the addresses, on the left; the machine code, in the middle; and the constants in the assembly, on the right. A binary file display tool is called a "hex dump". A binary file editor is called a "hex editor". That's how common hex is, so for the rest of the class to make sense, you've gotta learn it!